Dondale, C. D. 1986. 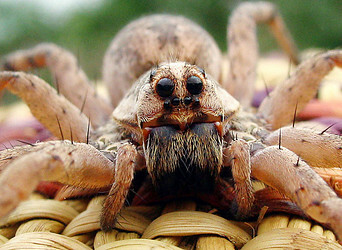 The subfamilies of wolf spiders (Araneae: Lycosidae). Act. X Congr. Intern. Aracnol. Jaca, España 1:327–332. Griswold, C. E. 1993. Investigations into the phylogeny of the lycosoid spiders and their kin (Arachnida: Araneae: Lycosoidea). Smiths. Contr. Zool. 539:1–39. Murphy, N. P., V. W. Framenau, S. C. Donnellan, M. S. Harvey, Y.-C. Park and A. D. Austin. 2006. Phylogenetic reconstruction of the wolf spiders (Araneae: Lycosidae) using sequences from the 12S rRNA , 28S rRNA , and NADH1 genes: Implications for classification, biogeography, and the evolution of web building behavior. Mol. Phylogent. Evol. 38(3):583-602. Zehethofer, K. and C. Sturmbauer. 1998. Phylogenetic relationships of Central European wolf spiders (Araneae: Lycosidae) inferred from 12S Ribosomal DNA sequences. Mol. Phylogent. Evol. 10:391–398. Vink, C. J. 2002. Lycosidae (Arachnida: Araneae). Fauna New Zeal. 44:1–94. Vink, C. J., A. D. Mitchell and A. M. Paterson. 2002. A preliminary molecular analysis of phylogenetic relationships of Australasian wolf spider genera (Araneae, Lycosidae). J. Arachnol. 30:227–237.